Lee Levin, an author and descendant of the famous Lee family of Virginia, died of amyotrophic lateral sclerosis, Lou Gehrig's disease, Thursday at home in Pikesville [Maryland]. She was 84 and lived on Chesholm Road for many years before moving to Pikesville several years ago. Her great-grandfather Edmund Jennings Lee II was a first cousin of Civil War Gen. Robert E. Lee. Edmund Jennings Lee was the brother of Lighthorse Harry Lee, Robert E. Lee's father. Mrs. Levin was a self-taught writer, whose family history provided material for some of her works. In the mid-1950s, in a battered trunk in the basement of her Forest Park home, Mrs. Levin found the papers of her husband's aunt, Henrietta Szold, a Baltimorean who founded Hadassah, a Jewish women's service organization, and an early settler of what is now Israel. Using those papers, Mrs. Levin wrote "The Szolds of Lombard Street," which was published in 1960. Also in the mid-1950s, Mrs. Levdiscovered 100 letters by Enoch Pratt, the benefactor of Baltimore's public library system, in another trunk in her home. The trunk's contents had been examined in 1906 and largely forgotten. The Pratt letters included one written to Mrs. Levin's great-grandfather, John Knight, a Natchez, Miss., cotton merchant. 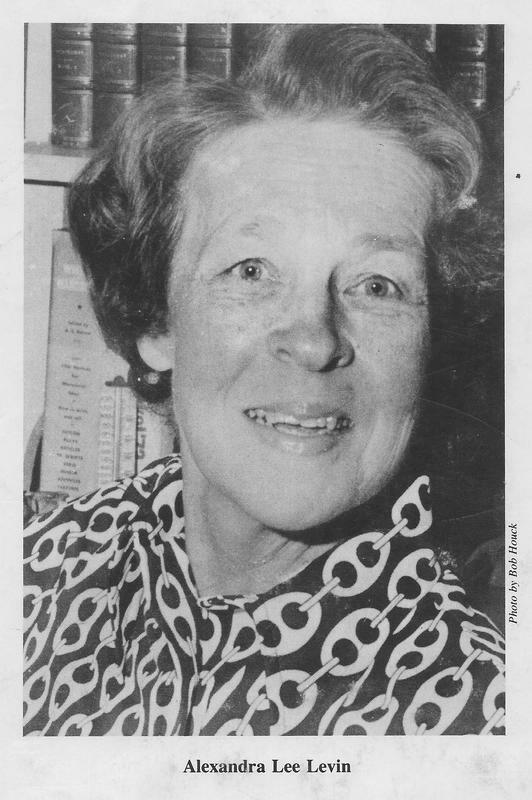 In 1972, she wrote "Dare To Be Different" about her father-in-law Louis H. Levin, who became executive secretary of Federated Jewish Charities and is credited with starting the practice of social work in Baltimore. Mrs. Levin's other works included "Vision," a biography of Baltimore ophthalmologist Harry Friedenwald, one of the foremost Zionists of the post-World War I era. "This Awful Drama," published in 1987, examined the career of Edwin Gray Lee, who was head of the Confederate Secret Service. Mrs. Levin also published a collection of letters written by D. H. Lawrence. Her last book, "For Brave America," was published in 1995. She was a prolific contributor to The Evening Sun op-ed page and other publications, including American Heritage, the Maryland Historical Society Magazine and the Jewish Historical Society journal. Born Alexandra Lee in Washington, where she was raised, she earned a bachelor's degree in history from Bryn Mawr College in 1933. In 1934, she married M. Jastrow Levin, a longtime biology teacher at Polytechnic Institute. She was a member of Beth Am Congregation in Reservoir Hill and the Society of Lees of Virginia. Services were held Friday. In addition to her husband, she is survived by a son, Lawrence L. Levin of Marblehead, Mass. ; three daughters, Betsy Levin of Washington, Sarah C. Levin of Columbia and Lexie Cohen of Randallstown; two sisters, Rebecca Lee Lukei of Carlsbad, Calif. and Frances Lee McDougal of New Haven, Conn.; four grandchildren; and two great-grandchildren.